The Philadelphia Phillies (5-1) toughed out a 10-4 victoryover the Minnesota Twins (4-2) on a cold, wet Friday night at Citizens Bank Park in front of a crowd of 28,021 that was obviously held down in numbers by the miserable weather conditions. What was a light rain as the game began picked up by the middle innings. The fourth inning in particular was played in a deluge that had to remind Twins skipper Rocco Baldelli of the rain-delayed Game 5 of the 2008 World Series. Baldelli was an outfielder with the Tampa Bay Rays during that Fall Classic and his home run briefly tied that game late during the renewal of play phase. The Phillies jumped all over Twins starter Jake Odorizzi in the bottom of the first inning. Jean Segura got it started when he doubled to right to score Andrew McCutchen, who had barely held up on a 3-2 pitch to draw a leadoff walk. One out later, Rhys Hoskins base hit scored Segura to make it a 2-0 lead. Walks to J.T. Realmuto and Cesar Hernandez loaded the bases and then Maikel Franco cleaned them off with a little help from some shoddy Twins defense. He looped a base hit to right field and then tried to stretch it into a double. The throw to second base by Twins right fielder Jake Cave rolled away and into left field, allowing an extra run to score, putting the Phillies up by 5-0 and chasing Odorizzi. Minnesota got two back in the top of the third when Max Kepler drilled a two-run home run to right field. But the Phillies answered with a sac fly by Hernandez to score Realmuto in the bottom of the frame getting the lead back out to 6-2. Jorge Polanco homered to lead off the top of the 5th and Cave later singled home a run to make it a 6-4 ball game. But again, the Phillies answered right away. With two outs in the bottom of the 5th both Hernandez and Maikel Franco worked walks. That brought up pinch-hitter Aaron Altherr, who delivered an RBI double to push the Phillies lead out to 7-4. Altherr was hitting for Pivetta, who left as the pitcher of record hoping for the bullpen to hold the lead for him. Adam Morgan started well, retiring four of five batters that he faced into the 7th inning. With one out in the top of the 7th, Polanco ripped a double just fair down the left field line off Morgan. 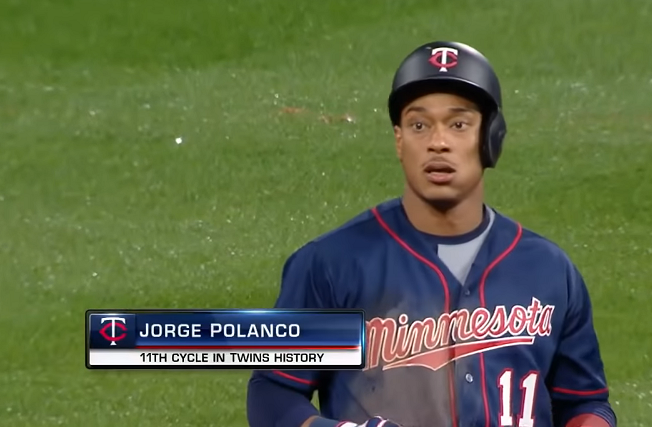 That hit completed ‘The Cycle’ for the Twins shortstop, the first for the Minnesota franchise since Michael Cuddyer accomplished the feat back in May of 2009. 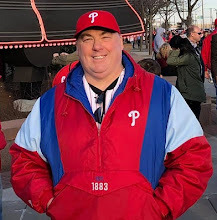 Gabe Kapler then reached into his bullpen again and pulled out Hector Neris, who worked out of that top of the 7th inning with the Phillies still holding their 7-4 cushion. In the bottom of the 7th inning the Phillies loaded the bases with two outs when McCutchen and Bryce Harper walks sandwiched a Segura base hit. That brought Hoskins, who looked good at the plate all night, to the plate with a chance to break it open. Break it open he did, ripping a base hit, Hoskins’ third of the night, to clear the bags and give the Phillies a 10-4 lead. Harper helped create the third run on the play as he never stopped running around third, catching the Twins defense napping. With that outburst the Phillies reached double-digits in runs scored for the second time in the young season. It also gave them at least eight runs scored in five of their first six games. It took until May 9 a year ago for the Phillies to reach eight runs for a fifth time. Pat Neshek worked a crisp 1-2-3 top of the eighth and then David Robertson came on for the 9th inning. He surrendered a two-out hit, but it was to Polanco, who slapped his fifth hit of the night. Robertson then closed it out by striking out Eddie Rosario and the Phillies had their fifth victory. Nick Pivetta: 5 IP, 9 hits, 4 runs (3 earned), 4 strikeouts, 1 walk. 83 pitches, 55 for strikes. Originally published at Phillies Nation as "Phillies fight through rain to blast Twins by 10-4 in series opener"